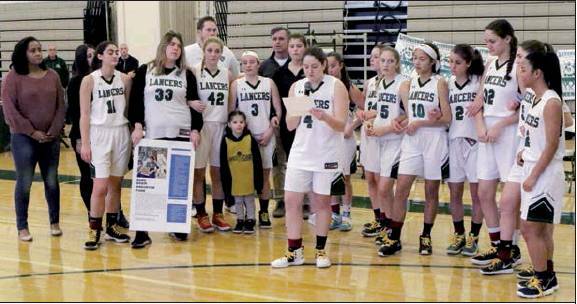 On Saturday, January 26, the Livingston High School varsity and junior varsity girls’ basketball teams raised money for the Duke Brain Aneurysm Fund in honor of player Aliza Gelman’s brother, Justin, who suffered a ruptured brain aneurysm last year while at Duke University. Thanks to the expertise of Duke’s Neurosurgery Department, Justin is fully recovered and has returned to school to continue his studies as a pre-med neuroscience major. In appreciation for the care he received, the Gelman family created the Duke Brain Aneurysm Fund, with the mission of “extending the reach of Duke’s life-giving care to patients across the globe by providing practitioners and caregivers beyond Duke with the advanced training and education necessary to ensure the best brain aneurysm care for everyone, everywhere.” Justin Gelman’s story was the topic of an article in the Tribune’s December 27, 2018 issue. To learn more, visit https://neurosurgery.duke.edu/about/donate/duke-brain-aneurysm-fund. To donate, visit https://neurosurgery.duke.edu/about/donate/duke-brain-aneurysm-fund/give-aneurysm-fund. Shown here, Lancer varsity basketball player Aliza Gelman addresses teammates and the crowd prior to the LHSCedar Grove game on Saturday, January 26. Behind Gelman, the Lancers stand in full support during the fundraiser.